A court order has declared India’s revered river a person with legal rights. But why is it being split into two – a deity to be protected in Uttarakhand and Uttar Pradesh, and a waterway of degradation in Bihar? “Digging up Gangaji to make a highway means bulldozing our lives and livelihoods. Sarkaar garib machhuare ke pet pe laath maar raha hai,” Amit Sahni (name changed), a leader of the Kagzi Tola fishing settlement at Kahalgaon, Bihar. On March 20, the Uttarakhand High Court declared the Ganga river as a “legal person”, creating many hopes, but also leading to many complex questions. What does the declaration mean? How could one now use this opportunity to empathise with the pains and injuries of the river? After this significant judgment, the river’s appeals can now be “formally” heard out in the court, which means that it has the right to demand the correction of the injustices it has faced. And yet, one must not forget the irony that we should depend on a human court to protect the river we have called our mother and deified for centuries. Different people see the Ganga differently. Is she Ma Ganga, the mother of Hindus? Or is she the washerwoman who accepts the dirty laundry, the corpses, the paan spittle and other rejects from millions? Or is she the protector of the turtle, the otter, the crocodile and the dolphin; or the courier of fertile sediment and silt to natural ecosystems? The Ganga of Gangotri or Haridwar, and the Ganga of Allahabad or Varanasi, are two distinct experiences of the same being. 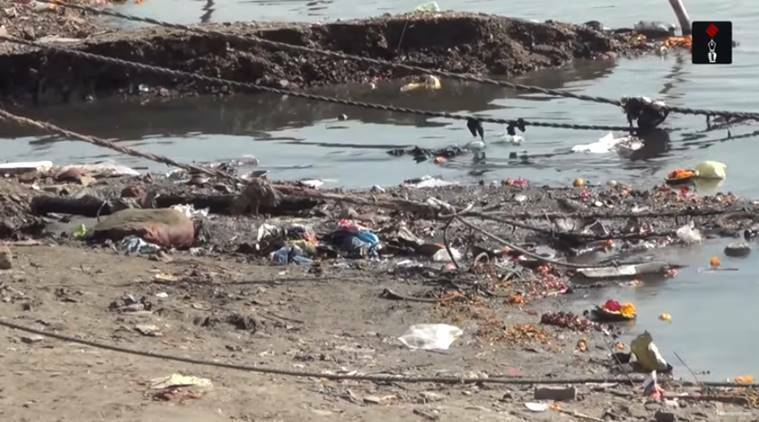 The extremely polluted and dying Ganga of Kanpur or Barauni is different from the spectacular, dolphin-dotted, deep river of Kahalgaon or Rajmahal. The Ganga in Uttarakhand is a hill stream, collecting thousands of springs before it enters the floodplains. Here, it must overcome congested and garbage-choked pilgrimage centres, the obstacles of the hydro-power projects and wrestle with the Tehri dam, which thwarts its natural course every now and then. In Uttar Pradesh, the river does find a little relief in the braided and wild floodplains of Hastinapur, and the last wild remnants of floodplain between Bijnor and Narora. Then, the Narora and Kanpur barrages rid the river of its water and fill it with sewage, pollutants and effluents. The river comes back to life again after the confluence with Yamuna at Allahabad. As it enters Bihar, after flowing through Varanasi, it regains its lost splendour, thanks to four (still alive) tributaries, the Ghaghra-Sarju, the Gandak, the Budhi Gandak and the Kosi, that contribute over 40 per cent of its flow. The river in Bihar is awe-inspiring: over two kilometres wide in some sections, it has vast expanses of floodplain interspersed with tamarisk scrub and farmlands. It has a healthy population of river dolphins and otters; fishing communities still manage to fish regularly, and the water quality is much better than in UP. The deepest point in the river, around the rocky islands at Kahalgaon, used to be over 50 metres deep in the dry season a decade ago, when I started my research on river dolphins there. Today, a view from the granite hillocks at Kahalgaon tells you what is happening. The river depth and its floodplain habitats are shrinking. Fishing communities are leaving as the river empties. Downstream of the Farakka barrage in Bengal, there is hardly any water flowing into Bangladesh. Despite the diverse geographies and ecologies along its course, the essence of the Ganga is undeniably a singular idea; it is a wholesome individual being. No matter what it says, the current government does not seems to think of the Ganga this way. The river’s “personhood” is being systematically fragmented and its soul split, with clever rhetoric, careful partitioning of political turfs, and unabashed ecological destruction. The flagship Namami Gange project has only been successful in splitting the Ganga into two convenient compartments. There will soon be two Gangas. The first part will belong to the water resource ministry, the other to the transport and shipping ministry. The first is to be a “spirituality package”; the second is to carry coal and cargo. It is worth noting that the Ganga clean-up project has focussed on Uttar Pradesh, in particular only till Varanasi. That plan appeases the holy priests, pundits and mahanths, who have been deeply worried about what their Ganga maiya has become. Today, Uttar Pradesh is the ideal substrate to execute the clean-up: there would not have been more political will for this at any time in the past. But, believe it or not, many Indians do not realise that the Ganga exists beyond Varanasi. This public ignorance comes in handy to popularise the clean-up mission, which has seen near-zero implementation beyond Varanasi — the wastes can then be dispatched downstream into Bihar and Bengal. This should not come as a surprise. The Ganga in Bihar is thought of as a dangerous riverscape, ruled by dacoits and diyara (floodplain) strongmen. It is unruly, with its frequently changing channel courses. It flows in a state ruled by noise-making foes of the government, and where the national ruling party itself was stung by defeat not so long ago. The river here is not the muse of saints, but just a large mass of water, where only insignificant hurdles like river dolphins, turtles and fisherfolk exist. The Ganga in Bengal, at Farakka, is, perhaps, not even a river, but just a trump card for continuing power games with Bangladesh. This is not at all to suggest that the Ganga is revered any less by the people of Bihar or Bengal. The Ganga is uttar vahini (north-flowing and deemed very holy) and worshipped at Sultanganj around the time of the Bol Bam Yatra. Bihar’s Ganga is also the site for offerings made to the sun god during the Chhatt Puja. However, for the government, it appears as if the veneration for the river disappears after Varanasi, where the river is being discounted, injured and destroyed for the development of National Waterway No. 1. The Ganga was declared the “National Waterway No. 1” way back in 1982. However, its “potential” to carry millions of tonnes of coal, cargo, and oversized goods was not realised. The 2016 National Waterways Act lists 111 rivers to be developed as national waterways, notwithstanding the fact that over half of them have no water left or flow as city sewers. The Ganga upstream of Varanasi-Allahabad does not feature in that ridiculous list. But downstream of Varanasi, river dredging is rampant and ongoing despite a stay order last year by the National Green Tribunal. In February and March 2017, when we were conducting fieldwork, intensive dredging was going on at six stretches between Buxar and Sahebganj, a distance of over 450 km. Large ships have started plying regularly. At Patna, work on the Gai Ghat port terminal is also in full swing. To put it straight, the scale of river “development” and destruction imagined by the waterways plans is monstrous. At present, our back-of-the-envelope calculations suggest that about 28 ships will pass the river within an hour at any point along its banks by 2020, if the projected capacity and infrastructure are built to carry the estimated tonnage. With river flows declining year after year due to unregulated abstraction by dams, barrages, and intensifying agriculture on its banks, dredging needs to artificially create river depth to allow the ships to pass. There is just not enough water even in the so-called “surplus” Ganga of Bihar. There are, hence, some (highly controversial) plans to build more barrages and navigation locks to artificially increase and level out water depth for ship passage. Bihar chief minister Nitish Kumar has expressed serious concerns about the proposals. The fishing communities on the Ganga are just coming to terms with its impact. “Digging up Gangaji to make a highway means bulldozing our lives. Sarkaar garib machhuare ke pet pe laath maar raha hai (They are kicking us in our stomachs),” says Amit Sahni (name changed), a leader of the Kagzi Tola fishing settlement at Kahalgaon. Between November 2015 and June 2016, following a period of intensive dredging, 20-25 people died by “accidentally” slipping in a sudden deep-water zone near the bank created by dredging. Most of the people were bathing at the river’s ghat and suddenly felt the ground beneath their feet slip, after which the current swept them away. These deaths went largely unnoticed, but their timings matched too closely with the dredging periods to be dismissed as coincidence. Dredging might also let loose sediment-bound arsenic into the river flow, and expose people to its effects over and above the dangers of chronic exposure to arsenic through groundwater in Bihar’s floodplains. The dredged sediment (500 cubic metres per hour) is flown downriver and gets deposited after travelling some distance. This requires more dredging to be conducted, in turn, and costs increase exponentially. Waterways, touted as “low-cost” and with little maintenance, just simply do not appear to be so. Over and above, the effects of dredging and ship traffic on endangered river dolphins in the Ganga (India’s so-called national aquatic animals) are particularly disturbing. Our scientific studies already suggest that Ganges river dolphins might have to deal with high levels of acute and chronic stress — caused by ship noises, dredging-induced sediment plumes and cavitation. The dolphins, who are naturally blind, rely almost completely on echolocation — using sounds waves and echoes — for navigating in their murky habitat. These alterations to their “acoustic environment” hamper their ability to move around. Many fishermen have told us how the Ganga used to have its own voice as it flowed past villages until the 1970s. Today, that dynamic, vocal flow, audible to the human ear, is muted as the river is robbed of water. Dolphin dive-times also show a two- to three-fold increase during ship passage, as compared to noiseless conditions. All these are sure-shot indications of metabolic stress. Similar impacts have been reported in other coastal dolphin species that live in high-traffic waterway zones, such as in Hong Kong. Though detailed studies are still needed, it is fairly evident from our long-term monitoring in eastern Bihar that dolphins left their preferred hotspots after dredging intensified. The shocking fact is that dredging goes on without any environmental clearances, including in the area within the Vikramshila Gangetic Dolphin Sanctuary in the Bhagalpur district of Bihar. No lessons appear to have been learned from the tragic fate of the now-extinct Baiji or Chinese river dolphin, whose population reduced by over half in the Yangtze river in the 1950s, after China undertook massive waterways development. Samuel Turvey’s book, Witness to Extinction (2008), recounts how the movement of ships converted the river into a such a highly noisy environment that it caused several dolphins to get cut by propellers and bleed to death before drowning and disappearing. With the river now able to get legal help, one also must hope that it soon gets medical help. Rajesh Nisad, a fisherman at Bhagalpur, urges us to do something: “Ganga mar raha hai… mar gaya hai (Ganga is dying… no, is dead).” As the law stands, the river is a person only for the Uttarakhand state, as of now. For a start, will we see it being unshackled from the hydropower damages there? In the current scenario, one hopes that this law pro bono sets the precedent for many more, especially urgently in Bihar. If we really wish to heal its wounds and restore the river’s personhood, we have to do more than clean a part of it. It is evident that no more development of the proposed scale (for waterways or for river linking) should be allowed in the future, unless we want to diminish our rivers’ existence to meaningless labels.